The long jump is no stranger to surprise winners on the boys side and this year may be more of the same. There's a solid bunch of boys that should push the 23-foot mark this season. 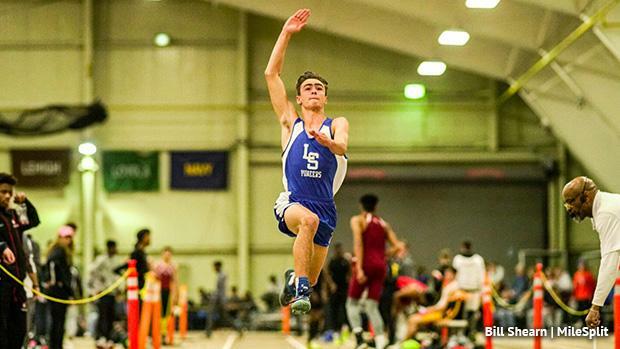 The top returner is Ezra Mellinger of Lampeter-Strasburg, who jumped 23-05.75 last year as a junior to win at the PTFCA Carnival. He wound up third at states, just under four inches off the win. Mellinger showed some good consistency with 22-23 foot jumps most the outdoor season, too, but took tenth at states in AAA. He'll have plenty of motivation to come back strong in this, his senior year. His best challenge to the top spot will come from Lance Hamilton of State College Area. As a junior last year, Hamilton jumped 22-06.5 to take fourth at indoor states, right behind Mellinger. He improved even more into the outdoor season, leaping a best of 23-08.75. Hamilton's State College teammate Jake Hefkin, who had an indoor best of 21-5.5, is the only other boy to have jumped over 23 feet, which he did outdoors. McDowell's Caleb Mabins is one of three returning indoor state medalists from last year. He was eighth at states last winter with his season-best jump of 22-02. Now a senior, Mabins will be in contention for the top spot. Cathedral Prep's Jaelen Carson jumped 22-01.5 last year and is one of four with a jump over 22 feet from last year. Among the other returning state qualifiers from last year are Spring Grove's Colson Martin, Manheim Township's Titan Cox, Hempfield's Darien Ressler, and Lower Merion's Adontrell Williams.